Natalie Berg is a trusted commentator for UK and global retail stories, with regular TV and radio appearances on the BBC, Sky News, Bloomberg and CNBC. She provides the media with objective views and analysis on retailer performance, strategic developments and industry/consumer trends. Moneywise: Can you really bag a bargain at outlet stores? Retail TouchPoints: Exclusive Q&A: How long will the ‘Amazon Effect’ continue to rock retail? Independent: From humble beginnings to master of the universe: How did Jeff Bezos make his billions? BBC: What went wrong on the High Street in 2018? Retail Insider: What future challenges does Amazon face? Retail Week: How would retail look if Amazon didn’t exist? 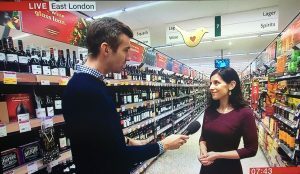 BBC: Is it the end of the supermarket checkout till? BBC Radio 4 Money Box: Time to say ta-ta to the till? Telegraph: Asos scraps generous loyalty programme – could we see the end of reward schemes? Retail Week: Analysis: Jack’s – Great British discounter or Brexit bargain store? The Grocer: Can M&S’s new celebrities win over young families? 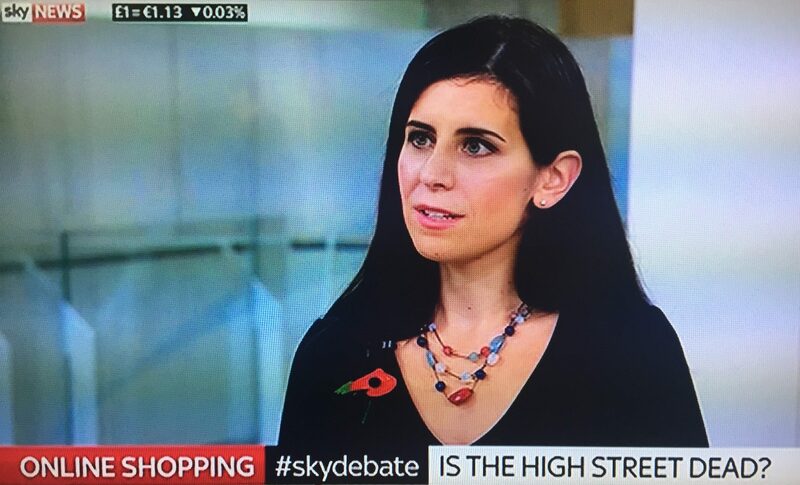 ITV Tonight (TV) Episode 28: Shopping: End of the High Street? 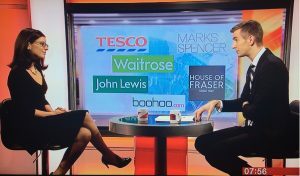 ITV: Shopping: End of the High Street? Essential Retail: Sainsbury’s-Asda merger: A new retail tech powerhouse? Huffington Post: What Could The Sainsbury’s Asda Merger Mean For Shoppers? ITV News (TV): Was private equity to blame for Maplin’s failure? 21 February 2018 — London, UK – NBK Retail officially opens its doors today, delivering valuable insights on the trends shaping the retail sector. The business is founded by Natalie Berg, retail analyst, author and industry commentator. 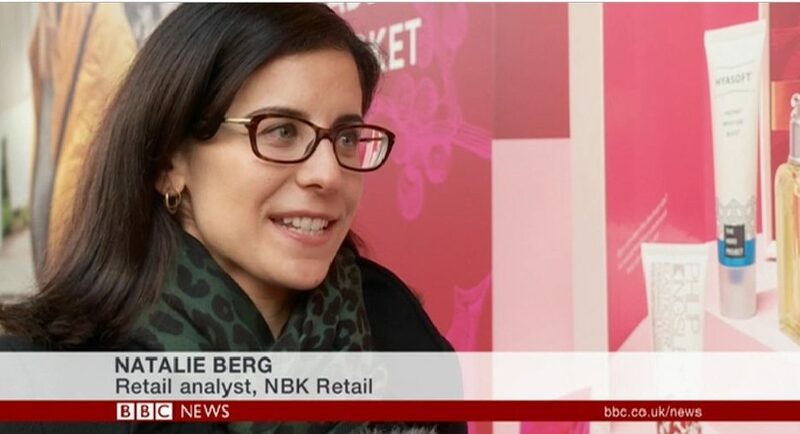 Berg launches NBK Retail with a stark warning to major players in the UK retail industry who she believes are sleepwalking into a retail apocalypse. “The UK retail sector is facing unprecedented levels of change,” says Berg. “The convergence of physical and digital retail is accelerating, which will lead to more high street closures and require a complete reinvention of bricks and mortar retailing. The store of the future will be less about transactions; instead it must become a hub for both experiences and fulfilment. NBK Retail marks its launch by publishing an infographic to highlight the biggest forces in retail in 2018. The consultancy, which specialises in retail trends and strategy, provides valuable insights to clients from a broad range of sectors including retailers, suppliers, advertising agencies, technology vendors, consultancies and the investor community. It launches amid a rapidly evolving sector and aims to enable retail industry companies to navigate the major forces impacting retail success. Berg has more than 15 years’ experience providing clients with an in-depth understanding of the retail sector and future trends, most recently as Director of Retail Insights at Planet Retail. She is a regular industry commentator for the BBC, Bloomberg, CNBC and Sky News. Berg is also a published author, and is currently finalising her latest book which is focused on the rise of Amazon, providing original insights at a time when the company is on the cusp of revolutionising itself even further.